Tricuspid valve dysplasia ("TVD") is rare in cats. That said, it is reported as the most common congenital heart disease seen in 17% of cats with congenital heart disease. The tricuspid valve is the valve that separates the top half of the right-side of the heart (the right atrium) from the bottom half (the right ventricle). This defect results in the valve not being able to close properly. 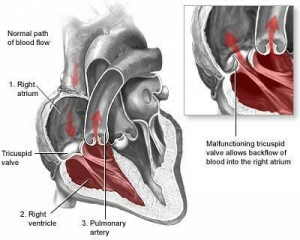 Malformation ("dysplasia") of the right atrioventricular ("tricuspid") valve causes backflow of the blood into the right atrium or tricuspid regurgitation. If the regurgitation is severe enough, the right side of the heart becomes enlarged. There may also be narrowing (stenosis) of the valve, making the heart works less efficiently. As the right side of the heart progressively increases in size, right-sided heart failure can occur. Congenital is defined as: any non-heredity condition, especially an abnormal condition, existing at birth or shortly thereafter. The mode of inheritance is still undefined. 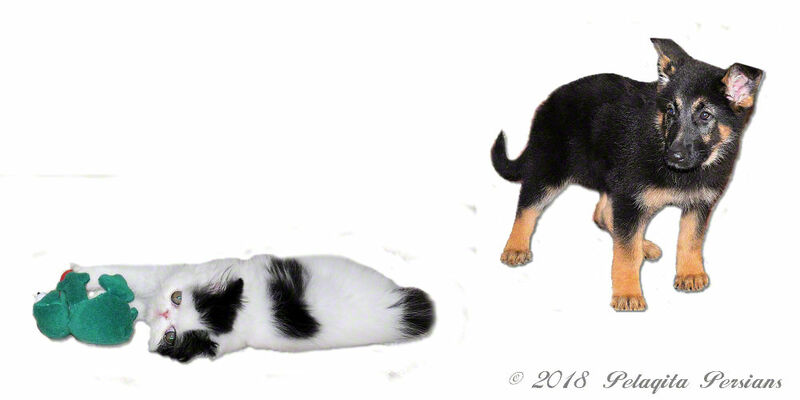 Tricuspid valve dysplasia has been identified and reported in numerous dog breeds: German Shepherd Dog, Great Dane, Great Pyrenees, Irish Setter, Labrador Retriever, Newfoundland, Old English Sheepdog, and Weimaraner. Tricuspid dysplasia is more common in males than females. UC Davis Veterinary Hospital identified 23 cats with TVD between August 1, 1986 and August 1, 1996, and the majority of these cats were mixed-breed. Signs of TVD may include reduced tolerance for exercise, fainting or collapse due to an abnormal heart rhythm, and a heart murmur. Tricuspid valve dysplasia is the most common cause of heart failure leading to ascites (abnormal accumulation of fluid in the abdominal or chest cavity) in cats. What Does This Mean for Your Cat? Often cats live for several years without developing heart disease. More severely affected animals with a greater degree of regurgitation (and / or stenosis across the defective valve) will develop right-sided heart failure. A heart murmur may be heard by the veterinarian long before the cat is showing any signs associated with the tricuspid defect. Further investigation by radiographs and electrocardiogram may reveal some of the changes that occur in the heart over time as it works harder to compensate for the insufficiency of the tricuspid valve. Some of the changes that occur may include enlargement of the right side of the heart and an abnormal heart rhythms. Medical treatment is more palliative and geared towards improving the patient's quality of life, delaying onset of congestive heart failure, and removal of ascetic fluid (a simple in-office procedure). Therapy is usually not started until signs of right-sided heart enlargement are present. There is no known successful surgical option at this time. 1. Case Studies in Small Animal Cardiovascular Medicine.